be on the safe side with Fovea Solutions. 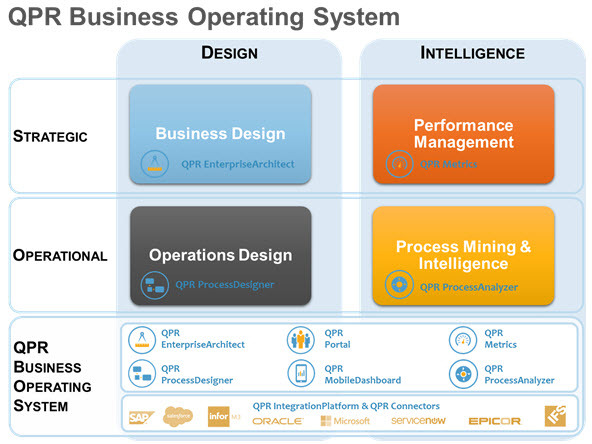 Unlike a Computer Operating System which takes care about the proper and faultless operations of computers, the Business Operating System (BOS) is the fundamental framework which takes care about the proper and optimal functioning and performance of Businesses. Process Mining is about using smart software to continuously analyze and visualize the flow of your operations, so that you can identify specific ways to improve your business. It’s easier and more cost-effective than many people realize – with near instant results. Performance Management – ScoreCard, Balanced Scorecard, Dashboard, HR ScoreCards, operationelle Riskscorecard, Compliancescorecard, strtegische Projektscorecard. Business Prozessmanagement – Processmanagement, ProcessAnalyzer, Qualitymanagement and Auditmanagment, EA Enterprise Architecture Processmodeling, modelling of Risikprocesses, Complianceprocesses, IT Processes and ITIL, Lean Six Sigma and EFQM. Datamanagement – Solutions for CDC Change Data Capture, Datareplication in heterogenous Database Environmnents, SQL and XML Mapper and Datasequrity by SSL. Many years of experience by Fovea Solutions are your guarantee for sustainable success in your future. Solutions from FOVEA are tailored for all industries. Danke für Ihren Besuch auf unserer Homepage, viel Vergnügen und Erfolg auf unseren Seiten. Wenn Sie uns noch nicht kennen und Ihr erster Kontakt mit uns durch die online Medien ist, würden wir uns freuen von Ihnen zu hören.